Queen Elizabeth has described as 'horrible' the headless mannequin used to show Kate Middleton's wedding dress in the ballroom at Buckingham Palace. The Queen and Kate toured the exhibit yesterday and the Queen could clearly be heard saying ' horrible' and 'horrid' during the tour. 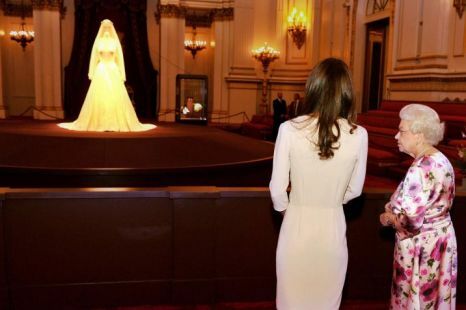 The dress by Alexander McQueen dress is on a headless mannequin and the tiara and the veil that Kate wore is suspended above it. “It’s made to look very creepy,” the queen said, while Kate responded that it had a “3D effect." The dress exhibit will run until October 3 and over 250,000 are expected to view it.